Totara, as an open-source learning management system is committed to evolve and improve according to the needs of its users. With rapidly developing new industry standards and the corporate learning market wanting to see them in the LMS, it was time to make some changes and do some things different from Moodle. ...select the needed equipment for each date. ...give directions to your event with the built-in Google maps custom field. One of the main reasons to part with Moodle was the need for a completely new and more flexible design feature. The new default theme with font based icons, makes it even easier to adapt to your company’s branding. It also incorporates current theming standards and is fully responsive. There are a lot of real-life examples, where a person is having multiple job assignments within a company. Up until now we struggled to map that in Totara LMS. The new functionality allows users to hold any number of custom job assignments. With each job optionally linked to a 'Position',' Organisation', 'Manager', 'Appraiser' and/or 'Temporary Manager'. Now we have the ability to nominate a different line manager for each job assignment, thus providing a better structure for reporting to the right persons. ‘My Current Learning’: easily access the content you, as a learner, should be currently working on. ‘Last Course Accessed’: access the course you were working on most recently. Does your company have pool accounts with people sharing the same email? Now administrators have the option to decide if users share email addresses, regardless of how the account was created. Administrators are now able to use a greater variety of quiz questions. Use drag and drop for the learner to fill in words or images, for example. This is a major improvement in user experience, allowing us to easily structure quizzes and to better design the learning paths. So far, the LMS brought us an annual release with the newly developed features, which meant that you sometimes had no access to them for almost a year. This approach could lead to additional cost for clients - say if they invested in a custom feature being developed in parallel by Totara but not available before the yearly release. 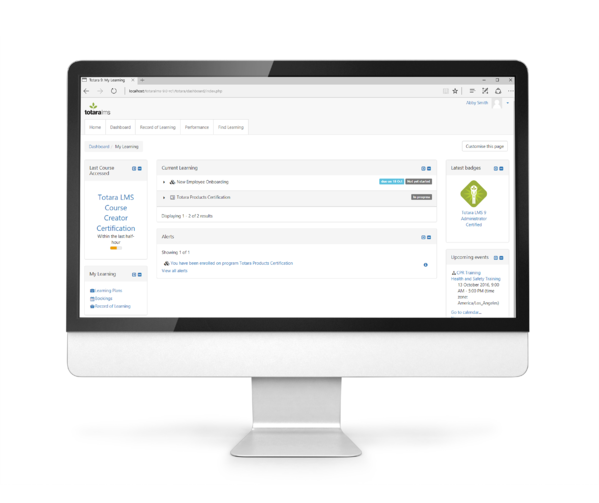 The new Totara Evergreen release process overcomes this issues and brings us unprecedented access to new features, starting with a monthly release schedule. In a follow-up post we will describe Totara Evergreen in detail so - stay tuned! To sum up - Totara 9 brings a lot of new features clients and users wanted to see in the LMS but also functionalities that allow for more flexibility, making Totara LMS even more intuitive. Now we are waiting for the next version of Totara Social, coming soon and promising great features, making further steps towards the integration with the LMS. If you have any questions about Totara 9 let me know in the comments. Georgi Dimitrov works as a Technical Lead for LearnChamp, supporting our developers. As an expert for Totara LMS he helps clients to implement and configure the open-source Learning Management System as well as making sure that all users adopt to the new system.